The Reflexe early music series from EMI's German subsidiary Electrola acheieved cult status in the 1970s, but since then has been absent from the catalogue. Now that is changing and some of the titles are appearing in EMI's new Electrola Collection series - Camino de Santiago: Musik der Pilgerstraße from Thomas Binkley and his Studio der Frühen Musik is seen above. These notable re-release are something else that has slipped under the radar as classical music focuses on the infinitely more important topics of a conductors's Olympic torch and boosting the profits of Coca-Cola, Lloyds TSB and Samsung. You are only reading this because I noticed the Reflexe releases in independent retailer Prelude Records yesterday. More music and chance here. If I may just correct you on one thing: the entire Reflexe series you posted about *has* been on CD, some of it more than once. I'm talking about the series 'Stationen europäischer Musik', with the 'fantastick' cover paintings, which consisted of 10 volumes of 6 LPs each (though, of course, there were other Reflexe recordings outside that series). The first SeM reissues appeared in the mid-price CDM 7 63... 2 series, in 1989 and 1990, and included more than half of the original issues; I bought several at the time. Then, in 1996, EMI tried reissuing SeM in the original order and in 'original jackets', i.e. as 6 mini-LPs in boxes corresponding to original 'Folgen'; as far as I know, they got as far as Folge II. Not surprising, as I'm sure they were too exepensive. But very nice - I have one. Finally, in 2000, they reissued the entire series in a 7243 8 26... 2 series. This was only issued in Germany - big mistake but increasingly typical of EMI and other companies, as they lost the plot. I hoovered up all the discs I was missing at MDC, when they were remaindered dirt-cheap. 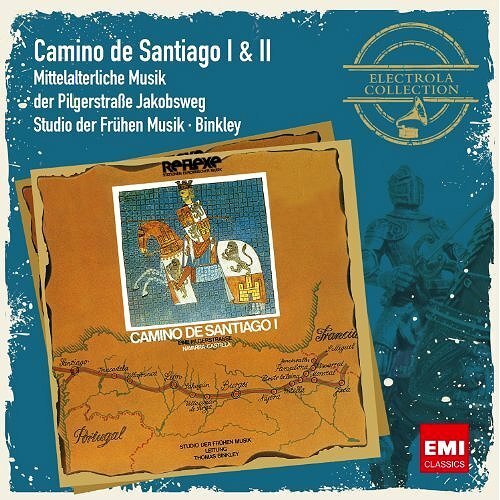 The 'Electrola Collection', which includes these two 'Camino de Santiago' discs, is a mish-mash. Yes, it includes very nice things: 1960s opera & operetta rub shoulders with some SeM discs, alongside yet older and newer early music discs, bits of Sabine Mayer and Ulf Hoelscher... Maybe, over time, it'll build up into a meaningful collection - but, of course, it will hardly be marketed, so nobody will notice it, so nobody will buy it, so it will be terminated and deleted... E la solita storia!